"The absolute best gift for any adventurous beer lover, our Ohio beer cap map is exactly what you need to show off all of your local or out of state brewery caps. 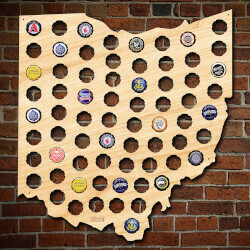 Available in all 50 states, this map of Ohio beer cap holder allows you to display beer bottle caps from every brewery in the state, and more! Laser cut on location in our Oklahoma workshop, each and every Ohio state cap map is made from all natural quarter-inch thick Birch plywood, and comes pre-drilled for wall mounting so you can quickly hang it with finishing nails get to tasting. Simply pop your beer bottle caps into the built in cap slots of the region, and it quickly becomes a beer inspired piece of art. Each Ohio beer cap map measures 17.2 h x 16 and holds 70 bottle caps.Custom made of handsome 1/4"" Birch plywoodEach state beer cap map holds 70 of your favorite beer capsExclusive design, which securely holds your bottle caps in place for display"
Personalized Canvas Art - Special..
Rock And Roll It: Flexible Roll-Up..